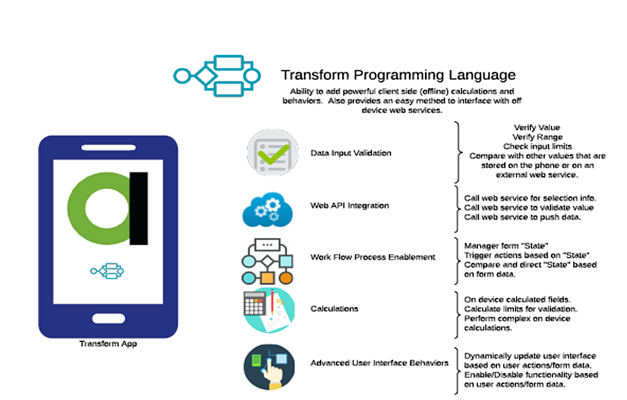 Alpha TransForm the only mobile form/data capture app builder with the flexibility offered by programmability. 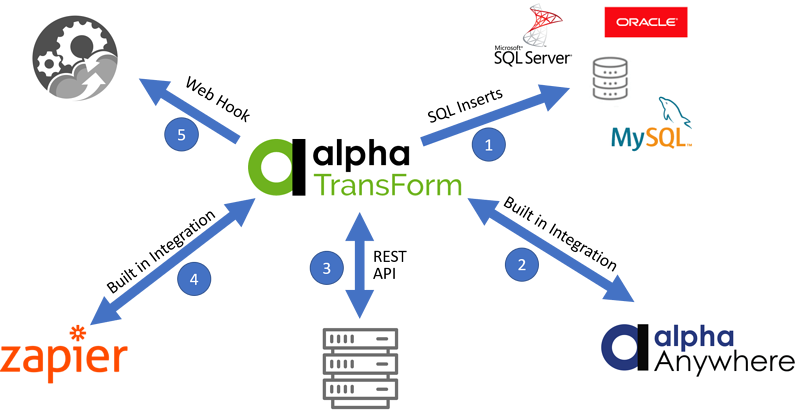 TPL and the on-device storage capability in Alpha TransForm. Scanning a barcode or selecting from a list and then having the contents of other fields automatically filled in based upon the contents of a SQL on-device database while off-line. Accessing REST APIs and other services when on-line to obtain data, do transactions, or for other purposes. Programmatically performing data validation and transformations, and applying complex business rules as the form is filled in. Filtering choices in lists based upon the values of other fields. Controlling all aspects of the Form Filler operation. Samples of Use: Some examples of TPL programs. Data Types: The types of data items and organization manipulated by TPL code. Data Model: The particular data structures available to TPL code, including form data and local variables, and how it is accessed. Expressions: The operators and operands that are used for computation. Statements: The types of statements, including those for looping, testing conditionals, and flow-control. Functions: Using built-in and user-defined functions in expressions. Execution: The times when TPL code is executed and the restrictions sometimes imposed. User-Defined Functions: Defining and using functions written by the form designer. Built-in Functions: An overview of the functions built-in to TPL. Built-in Zapier integration, a powerful API and web hooks turn your apps into full-blown business applications. SQL inserts Automatically insert data to your SQL backend database. Built in support for MS SQL, MySQL, Oracle, and many more. Zapier Created complex workflows, and integrate to thousands of other applications using Zapier. Alpha TransForm integration is built into Zapier. Alpha Anywhere includes a suite of features and tools to integrate TransForm into your Alpha Anywhere applications. REST API TransForm includes a robust API allowing you to deeply integrate TransForm into your own applications. Webhook to automatically post data to your own APIs when data are saved. Role Based Users Management: Assign different roles to different users. Assign users to be app designers, app users, administrators, and more. You can also limit the forms that are available to individuals based on the groups to which they have been assigned. Point and Click App Builder: TransForm’s patent-pending app building technology includes a Quick Input interface that lets you build an app simply by typing or pasting a list of fields. A point and click interface then makes refining and improving your apps a snap. Efficiently work with HUGE forms even on a small screen: Large button numeric keyboards, finger-friendly date pickers, one-button timers, field swiping, and more make data entry, smooth, natural and efficient. Collect better quality data in less time. Forms with hundreds (or even a thousand) fields can be used efficiently even on smaller mobile phones. Through a combination of pagination, swipe navigation, an automatic table of contents, and other search tools, users can instantly find the part of the form they need see or fill in. Error Checking and Data Validation: Catch and correct errors early. Set minimums and maximums, compare against previous values, check for omissions, and perform calculations to verify that proper data are entered. Plus the user can get customized help on how to correct bad data. Store, Access and Capture Large Documents and Huge Amounts of Multimedia Data: Ideal for field service and other applications, TransForm allows you to store and access PDF documents, videos, and other files from its onboard data store, and It can work with onboard SQL (SQLite) databases. This means field workers can instantly refer to service manuals and training videos or search parts and inventory lists - without relying on an internet connection. Take as many pictures as you need, TransForm intelligently manages the storage of large media files, automatically offloading them from the device to the cloud to free up device memory. There is no need to tediously delete unneeded files manually. Dispatch Requests to Field Workers: With TransForm you can send pre-filled forms (like work orders, inspection forms, etc.) to workers in the field. 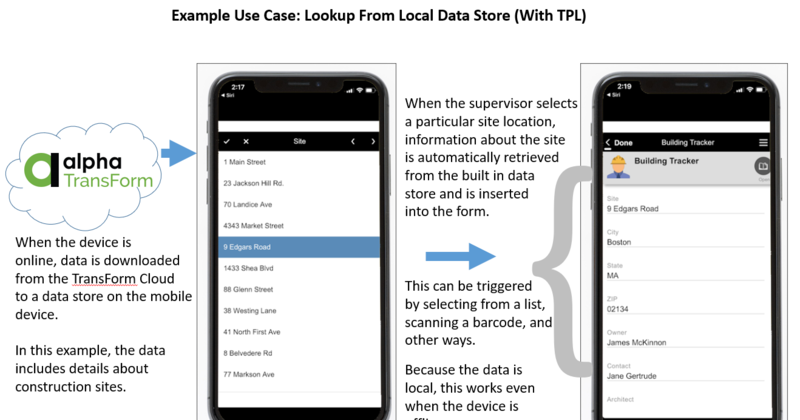 When they open the TransForm app on their mobile device, these forms appear – so they worker knows where to find their next assignment and what to do when they get there. Review and Export Data: Review the data collected in the field, and export it to a variety file formats, including PDF, MS Excel, plain text and more. 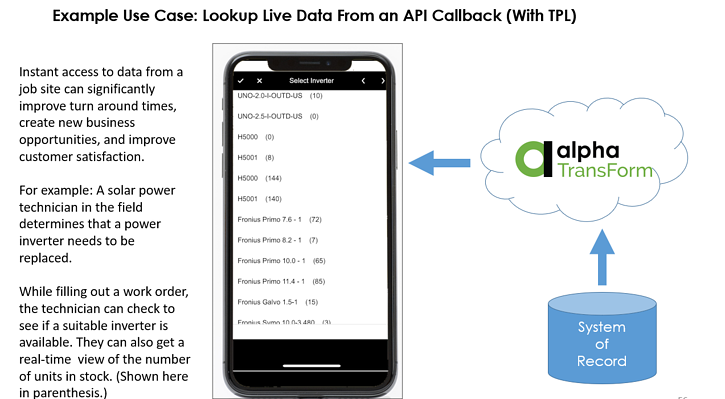 Trigger Actions to be Performed When Data are Submitted: Automatically send text messages, post records to another database, email reports and more. IF / THEN / ELSE Commands: Show or hide follow up questions based on previous responses, so that user is only presented with the fields that are necessary. You can also use IF/THEN to guide workers into collecting the most relevant information, and to help diagnose a problem. Launch Online Driving Directions and Other Services: TransForm takes full advantage of the features built into mobile devices, like the ability to get driving directions, check weather forecasts, place phone calls and more. You can easily integrate these services into your own apps to provide workers with optimal routes to their next assignments, automatically call clients, and perform other tasks. Built-in Zapier Integration: TransForm includes prebuilt Zapier zaps, that allow you to exchange data with SalesForce, Google Sheets, and more – without any programming. See next section for more integration options. TransForm has similar power, programmability and control as low code platforms, but allows apps to be built in hours/days vs weeks/months. Plus TransForm apps can be modified virtually instantly whereas Low Code apps would require re-coding and resubmitting to apps stores (takes many days or weeks). TransForm has similar easy of use/speed of development as mobile forms platforms, but it offers the assurance and comfort that apps can be built without worrying about reaching the limits of the platform before the requirements can be met. Key reasons for this: 1) TransForm is fully programmable, 2) It can store vey large amounts of reference data and media offline, 3) it has comprehensive integration with systems of records & 4) is fully responsive.